While much of the country spent the weekend frantically shopping for the rest of the people on their holiday gift list and wondering just how long much longer they’ll have to give all the credit to Santa before their wide-eyed, innocent, grabby, Halo 3-obsessed children can take the news without falling into an hour-long shrieking fit, Reds fan lined up for the annual Redsfest. The Crack Technical Staff and I were in attendance to drink beer and make smart alec remarks. Not to be outdone by Mr. Red, Gapper shows off his tambourine stylings. Watch out Jan Brady! 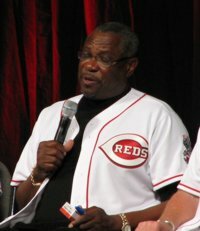 “Well, Bobby, I played Neifi so much because he had guts,” Dusty Baker explained while fielding softball questions from children in a charming PR opportunity. 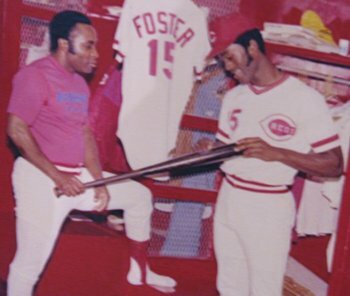 The Reds unveiled the latest development in protective equipment technology. 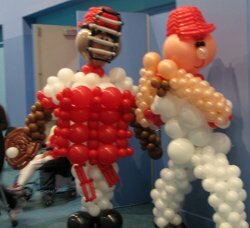 Rumor has it that Ken Griffey, Jr. will be the first to be entirely covered in balloons to provide a protective cushion in case of falls. His range isn’t expected to decrease much. 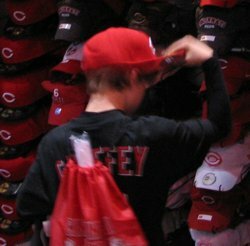 He’s no Pokey Reese: A young Cincinnati fan tries on a Reds cap at a somewhat askew angle. 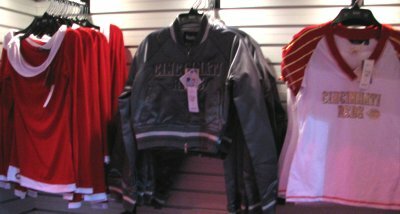 The souvenir shop featured the Touch line of clothing that will never look as good on you as it does on Alyssa Milano. I’m skipping the joke to tell the real story of this photo. Phillips was leaving the autograph area after completing his time when he comes upon a group of fans in the hall. Even after an hour of signing, he tried to get the security guys to let him sign. Too bad they ushered him away. Why do guys always need to compare bats? The Screaming Mimes closed out the event and had people literally dancing in the aisles. Sure, they looked a little crazy dancing that way, but credit to the Mimes for inspiring them. I was wondering if you were at Redsfest. 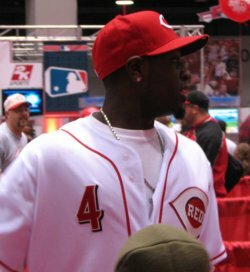 Anyone go to RedsFest this year? Record attendance, I’m told. Red Hot Mama has a nice recap, with video and pictures. I can’t believe she didn’t purchase the Tom Shearn jersey, though. Come on! Bobby Livingston is cute, but Bronson is the hottest guy on the team!!! Anyways, Redsfest was packed! They need a bigger area to hold it in so you’re not smooshed up against other people. It is pretty cool that the players come out & interact with their fans. Did anyone go to Bronson’s concert on Fri.? I’m looking for the name of one of the songs they played. It was the song his saxophone player sang. If anyone can help me out, I’d appreciate it. Sweet: we haven’t had a hottest Red discussion in a long time. I’m not seeing it in Arroyo. The dude is a beanpole. I’d be helpless against that Brandon Phillips smile, and Matt Belisle isn’t bad either. Seems like the team, as a whole, isn’t as hot as it used to be.